Note: This article was updated in January 2018 with a fresh set of "Our Picks". If you're interested in the latest seasonal trekking gear recommendations, head over to our recommended gear page. Trekking is a delightful and simple activity. Trekking clothes, however, are a different story. To someone just starting out in trekking, the array of clothing choices can be complex and bewildering. In this article we break clothing down to the basics. You don't need to buy a new wardrobe before you hit the trail in the Himalayas, but you'll need a few basics to stay safe and comfortable. The rule of thumb for choosing the right clothing on any trek is to extensively research your route and to avoid cotton. More research means you wear few yet more appropriate clothes. Appropriate clothing keeps you better equipped for emergencies and inclement weather conditions. Appropriate clothing also means you carry less weight on your back. The terrain that you shall encounter and the weather on your trek days are the two aspects that you need to research for deciding on what to wear. inditramp provides terrain, weather and other relevant information for every trek on our website. We recommend that your outdoor clothing be as cotton free as possible. Ditch those fashionable jeans and cotton t-shirts for a synthetic base layer. This is because a synthetic layer wicks perspiration, dries quickly and is stretchier. Wicks Perspiration - Most synthetic clothing is non-absorbent. This means it moves perspiration away from the skin and spreads it over the garment to speed up evaporation. This leaves you less damp and clammy over an extended physical exertion. Dries Quickly - Synthetic garments dry off much faster than cotton garments without drawing away body heat. This reduces the risk of dramatic swings in body temperature. Is Stretchier - Synthetic clothing is better at retaining shape after being stressed. This makes it better for strenuous activities like trekking. This is a list of 9 essential clothing items distilled from our research and experience in the Indian Himalayas. You may supplement this list with warm and / or rain clothing where it is appropriate. A visor or baseball cap. On a sunny day this shall keep the sun off your face and on a rainy day it keeps the rain off your eyes. May be worn in combination with a bandana to avoid sunburn on the neck and face. Look for a cap with a longer than normal sunshade, because it will provide better protection. Cycling 700 sunglasses (₹ 1,999 / < 100 grams). Comes with category 0, 1, 2 & 3 interchangeable lenses, full UV protection, adjustable nose clip and a vent to prevent fogging. One of the few items, where cotton fabric is preferable. A bandana is a versatile piece of clothing. It may be used as a scarf to protect the back of your neck from sunburn or a towel to dry off your sweat on a hot day. At higher altitudes, a bandana over your mouth means that you inhale moist air and it prevents getting a sore throat. Some of my female companions prefer the a bandana as a pee wipe. Choose a size large in orange, red or any such bright colour. It may be used as a signal flag in an emergency. Synthetic boxers or sports bra - Cotton innerwear is notorious for bunching, staying wet and chafing. Choose form-fitting, synthetic inner wear, preferably without seams to avoid chafing. Under Armour synthetic Boxers are 70% Polyester and 30% elastane which means they wick promptly and don't bunch up. Comes with thick performance waistband. Under Armour Eclipse Non-Wired Sports Bra comes with a breathable mesh lining, breathable cups and criss-cross straps in the back for better support. A full sleeve synthetic /merino wool t-shirt. A full-sleeved t-shirt provides better protection from sunburn by keeping the sun off your arms. It also helps protect against flies, ticks and other flying nasties. A half zipper in the front helps with ventilation. If you can afford merino wool clothing as those made by icebreaker, then by all means go for it. Most of our testing staff prefers wool as it feels more natural against the skin and it tends to hold off body odour longer than synthetic clothes. However, it is much more expensive and frays faster than synthetic clothing. Quechua Techfresh 100 (Rs. 799 / < 100 grams ) - Simple, lightweight synthetic full sleeve top. It is well ventilated and offers under arm inserts for better ventilation and odour control. Synthetic lightweight trousers are the way to go. Avoid cotton and denim trousers. Cotton and denim are heavier, absorb water and take longer to dry. 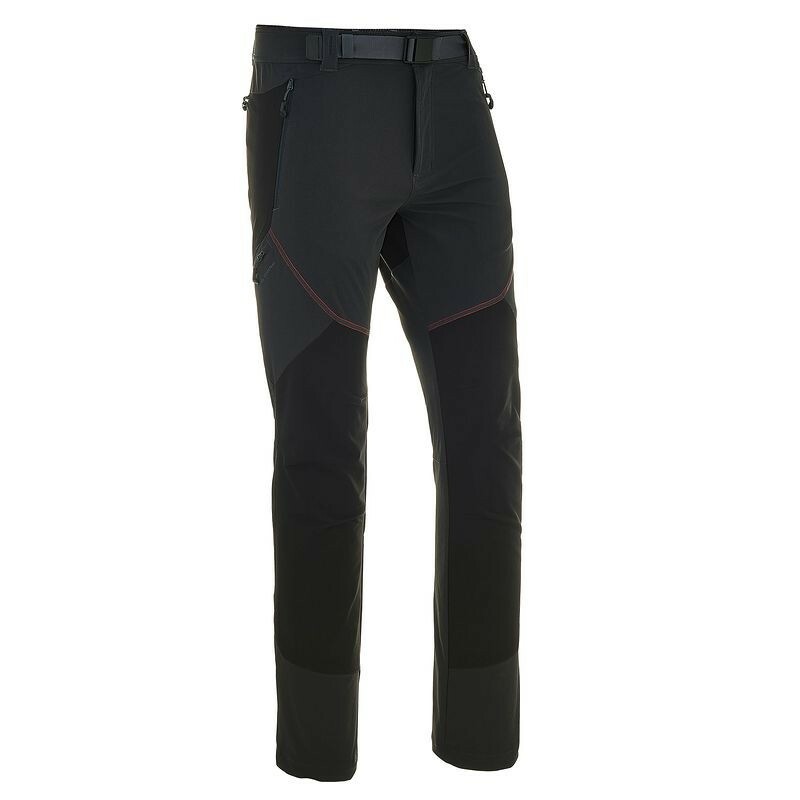 Prefer trousers that have zippered pockets and are reinforced in key areas like knees and the seat. Pants are more versatile than shorts and offer more protection. You can always roll the trouser bottoms if you need more ventilation. A combination of lightweight inner liner socks, and outer thicker "sports" socks. Preferably synthetic and ankle length. Inner socks provide wicking and outer socks provide cushion and support. Decathlon's Forclaz 500 for inner socks (Rs 549 (2 pairs), < 100 grams) and a pair of Hans Siachen Merino wool socks (Rs 1400, < 100 grams) for outer socks. At inditramp we have an inclination for lightweight trail running shoes over heavy boots. Look for shoes that offer reinforced toe box and sides and come with bigger and more aggressive outsole lugs. It's a shame that the Kalenji Kapteren Crossover have been discontinued and Decathlon has no worthy replacement. We reviewed and loved these lightweight trail runners. Nevertheless, Columbia's Peakfreak XCRSN is a tough leather shoe with an excellent grippy outsole (₹ 5099). A watch helps keep a check on distance and speed. A trekking watch must feature a time, day and date display. Yes, we are not ashamed to admit we have lost track of dates and days on a multi day trek. A hourly chime and an alarm are a useful add-on too. Casio F91-W (Rs 799 / 20 grams). Cheap, lightweight, rugged and water resistant. It features an hourly chime, single alarm, stopwatch, day and date. We promised you nine items, but here's a piece of essential clothing that all our testers swear by. Gaiters strap over the trekking shoe and around the person's leg to provide protection from branches and thorns and to prevent mud, snow, etc. from entering the top of the boot. Most Himalayan treks will involve scree, mud and wet grass and your feet will thank you for the added protection that gaiters give. Lowe Alpine Gaiters (Rs 2799 / < 100 grams). Extremely sturdy but expensive.